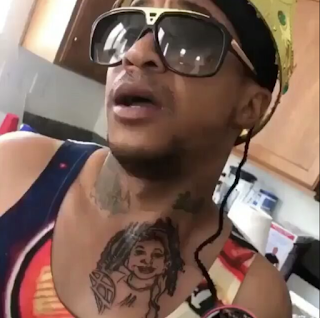 Rhymes With Snitch | Celebrity and Entertainment News | : Did Orlando Brown Tattoo Raven Symoné's Face on His Chest? Did Orlando Brown Tattoo Raven Symoné's Face on His Chest? If thats supposed to be Raven then he needs to get his money back. The tattoo looks like him. Looks like Susie from Rugrats. I'm going with a Rastafarian..i see dreads.